Perhaps the BBC and others are having a fit of pre-COP optimism, but two recent stories would lead the reader / listener to the view that the world is at last turning the corner on emissions. This started with BBC coverage of a report from the Netherlands Environment Agency which provided an assessment of global emissions for 2012, one of the most up to date reviews of global greenhouse gas emissions. 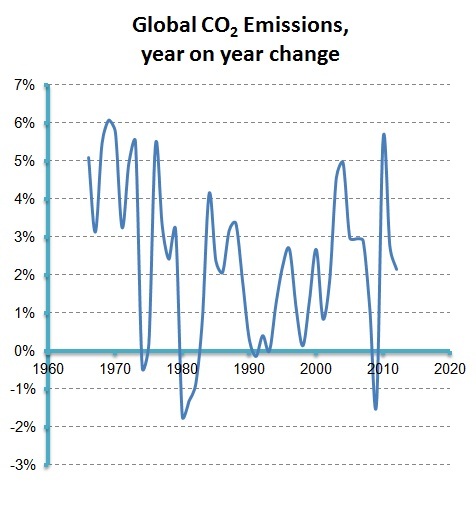 While the report showed actual global emissions of carbon dioxide from fossil fuel use and limestone calcination (cement) reaching a new record of 34.5 billion tonnes in 2012, it noted that the increase in emissions in that year slowed down to 1.4% (corrected due to the leap year), which was less than half the average annual increase of 2.9% over the last decade. The BBC argued that this development signals a shift towards less fossil-fuel-intensive activities, more use of renewable energy and increased energy saving. Not to pour cold water on this, but the recent publication by BP of their Statistical Review of World Energy didn’t show such a marked change, although the rate of increase was certainly down. The chart below shows how the rate of increase (according to BP) has changed over the years, but it’s hard to argue that we have broken out of the long term range. The BBC followed this with a BBC World report, including an interview with David Kennedy, CEO of the UK Committee on Climate Change, where they argued that the world is turning a corner in terms of climate cooperation, clean energy deployment and ultimately emissions. The evidence for this was rather scant, but included a look at a very sophisticated heat capture system in Norway which exchanges heat from waste domestic water in Oslo. They also presented a chart which showed the world decarbonisation trend, i.e. CO2 per GDP, and drew solace from the fact that the Chinese decarbonisation rate was increasing (note that CO2 per GDP requires estimates of both global CO2 emissions and global GDP and that these numbers can vary from source to source). The BBC did note that the world “has much more to do”, but that there is finally cause for optimism. The reality check on all this comes from PWC, with their new report Busting the Carbon Budget. They also focus on decarbonisation rates, but looking forward rather than back (where, unlike the BBC, they had no cause to celebrate at all). PWC note that if the world maintains the current decarbonisation rate of about 0.7% per annum, the global carbon budget for a 2°C pathway (IPCC RCP2.6 scenario) will be depleted by 2034, just 20 years away. Meeting RCP 2.6 now requires a decarbonisation rate of 6% per annum. Meeting the budget for the less ambitious RCP 4.5 scenario requires rates of 3% and even “meeting” the RCP 8.5 (4°C) scenario budget still requires decarbonisation rates which are double current practice. The PWC report delves into national data as well and notes that Australia, the USA and Indonesia are the only three countries that have recently come close to the needed decarbonisation rates but that not one country has managed to sustain such a rate for five years. PWC finds that energy efficiency is the bright spot in that almost all of the change in carbon intensity can be attributed to efficiency improvements. For me, this is a cause for concern, in that intensity improvements are therefore masking that lack of progress on real energy mix decarbonisation. Efficiency will drive GDP, which in turn can give the appearance of decarbonisation when in fact there isn’t any. PWC note that CO2 per unit of energy consumed has remained at approximately the same level for five years. The shale gas revolution in the USA is causing US coal to shift to other parts of the world (which highlights the need for more widespread adoption of carbon pricing). Biofuels consumption is largely confined to the Americas. There is a slow rise in renewable energy but reliance on fossil fuels is effectively unchanged. Nuclear is losing ground following Fukushima. There has been negligible progress in the deployment of CCS technology. PWC conclude with the statement “Crucial is the collective will to act.” According to the BBC and the UK CCC we may be turning the corner in the regard, but let’s wait until COP 19 in Warsaw next week to see how that one develops. David, I am optimistic, but only conditioned on real decisions and action, now. I believe the only sure way to achieve real, concrete, verifiable reductions in CO2 is to start retiring and dismantling refineries, coal-fired power plants, and fossil fuel-fired industrial and commercial boilers, heaters and furnace — without replacing them. Plants that produce portland cement, likewise. Reducing the output of the source products (oil, coal and gas) will cause a rise in prices which would be a ‘de facto’ carbon pollution fee. Steadily reducing the carbon-based infrastructure and production will require diligence and belt tightening in the initial stages, but the price signal should shift investment capital to carbon-free technologies, or not. But if the goal is to reduce carbon, that is one sure-fire way to do it. 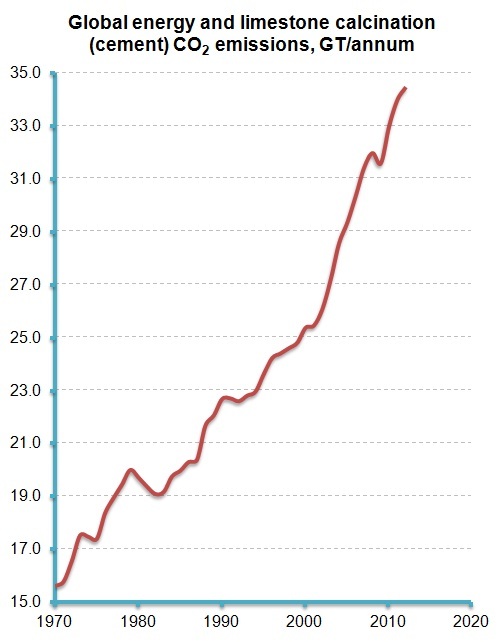 It is not possible to begin reducing CO2 emissions until you first stop increasing CO2 emissions. The increases are occurring in Asia, where there appears to be limited interest in halting and later reversing economic growth. Hard to disagree with that logic. Thanks.